Welcome to our Dual Action Orbital Polishing Guide. Learn how to remove swirls and scratches, polish away oxidation, and apply wax using your Porter Cable 7424XP. These guides explain proper techniques and suggest what swirl removers, polishes, waxes, and sealants will give you the very best results. The techniques described on these pages will get you started on your way to smooth, shiny paint, regardless of the age of your vehicle. Examples of a dual action polisher include the Porter Cable 7424XP 6" Variable Speed Polisher , the Meguiar's G110 Dual Action Polisher, the Griot's Garage 6 Inch Random Orbital Polisher and the Flex XC 3401 VRG Orbital Polisher. What is a dual action polisher? Dual Action polishers are characterized by the motion of the head. It spins on a central spindle, and this spindle rotates around an eccentric offset. 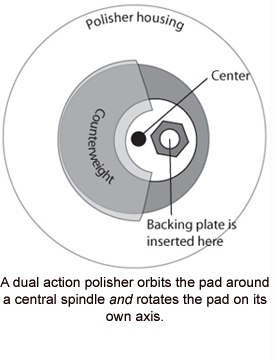 A good metaphor for a dual action polisher is the earth's orbit. The earth itself spins and it also orbits around the sun. Dual action polishers are also called orbital polishers for this reason. To the right is a simplified illustration of the underside of a dual action polisher, like the Porter Cable 7424XP or the Meguiars G110 Polishers. You can see how the opening for the backing plate sits off-center. The counterweight sits opposite the backing plate to balance the weight of the pad and plate to prevent wobbling. The rotating and orbiting of the pad produces what many refer to as a "jiggling" motion. This irregular motion prevents the polisher from burning the paint, which refers to removal of paint below the clear coat surface. Dual action polishers are very USER FRIENDLY because they produce very little heat compared to a rotary polisher. The same safety feature which reduces the possibility of damage from a dual action polisher also prevents it from removing very deep scratches. While a dual action polisher will improve the appearance of scratches and remove most swirls, it does not produce enough heat to cut deep into the paint. If you need deeper scratch removal, this will require a rotary or circular polisher. Keep in mind, rotary polishers in inexperienced hands can quickly burn the paint. The pad spins at high speeds and it's up to the operator to keep the polisher moving at all times. If the polisher lingers for a second too long on one spot, it can burn through the paint. See our Circular Polishing Guide for more information. Dual action polishers will improve the texture and luster of automotive paint with virtually no risk. They are the most user-friendly option for beginners and professionals, and they consistently produce beautiful results. Note: Scratches that extend below the clear coat should be repaired by a professional. Attempting to remove these deep scratches could result in removing too much clear coat and causing the paint system to fail. If your fingernail catches on a scratch, consult a professional. We carry premium foam pads by Lake Country, Meguiars and Cobra. All the pads listed work with a hook and loop backing plate. The directions in the CCS Smart Pads Guide apply to all types of hook and loop pads, but check with the specific brands' pad decriptions for detailed information on the types of foam available. The guides below will outline the pads and how to use them to remove swirls, polish, and apply wax.